#8-02 Rustic appearance of this metal pool table lamp is a perfect compliment for many antique Brunswick pool tables. "Hammered" metal bar with circular accents at each end. 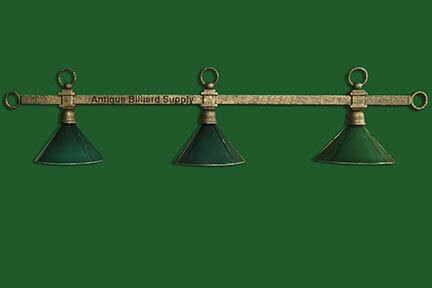 Very rare antique two-tone glass shades with white inside and green outside for good visibility and minimum eye strain. Includes metal chains and ceiling mount.